Inbox is an optional feature. If you're interested, please contact us. 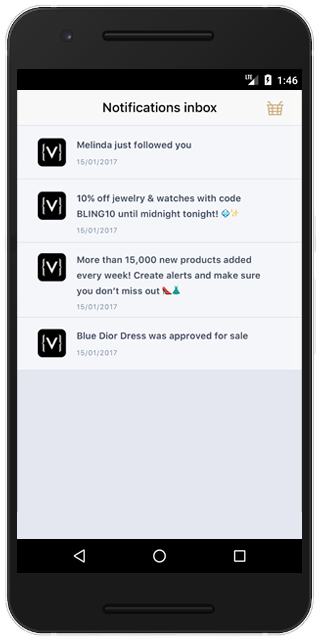 Introduced in Batch 2.0, the Inbox API allows you to fetch and process notifications that this user has previously received, even if their device was offline. This screenshot is an example of what you can achieve with the Inbox API, but Batch does not include any UI. The API gives you access to the entire notification, including its raw payload. It also lets you know if the notification has already been read. Note: Just keep in mind that, once received/stored in the inbox your push notifications will remain for a 3 months period. This mode will fetch notifications that the current app installation, and nothing else. If the user clears the app's data, this inbox will be cleared. This is great for applications where your users don't have to log in. This may cause privacy issues if your app has an identification system. This mode will fetch notifications for the specified custom user ID, even if they just installed the application and already got notifications on another device logged in with the same user identifier. If your application has a login system, this is the mode you should use. Since notifications can have sensitive content, you cannot get a user's notifications simply with their user identifier: Batch requires you to authenticate your request. First, you will need your inbox secret key. You will find that in your dashboard, below your API Keys. It is unique for every app. The authentification key is generated by computing a sha256 hmac hash of the API Key and the user identifier, using the secret as the key. Then, you have to encode the hash in a hexadecimal string. For the API Key "abcdef", user identifier "paul", and secret of "foobar", the expected authentication key would be 796f1ab5d119d1b2eab8201e60335b56d1befff40c0f80263d64a169a8fd2e45. Once you've fetched notifications, you will end up with a list of InboxNotification objects. * Unique notification identifier. Do not make assumptions about its format: it can change at any time. * The push notification's source, indicating what made Batch send it. It can come from a push campaign via the API or the dashboard, or from the transactional API, for example. * Inbox Notification Source enum. * To be used with batch.inbox fetched notifications. This enum's implementation is available on batch.inbox.NotificationSource. "com.batch" is Batch's internal payload: You should not make any assumption about its content, nor depend on it. We reserve the right to change it at anytime, without warning. Standard parsing good practices apply: Make sure to check every type and handle errors gracefully, and never assume anything about the payload's content.